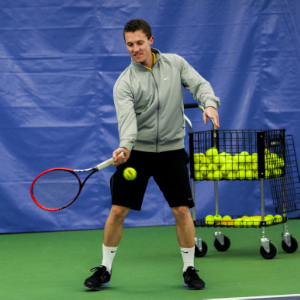 We have adult tennis programs for players of all skill levels. Adult clinics are a great way to improve your skills under the instruction of a certified pro and the support of a small group of players like you. We also have point play and match play drop-in clinics and USTA team practices. Come and enjoy fun and encouraging atmosphere! Instruction will focus on stroke development, drills and strategy to further your tennis game. $150 deposit required for placement. A great way to build trust with your partner on the court! Practices will consist of drills and situational tennis strategies that will applied in a match play setting during the last hour. Your mental toughness, shot selection, teamwork and flexibility to play with anyone will al be tested! If you don't have a partner no worries, as we will fit you into an appropriate leveled clinic. Teams from 2.5 - 4.5 level. We offer competitive leagues during the day, evening and weekend hours. Our league coordinators will help you find the best program for you. Point Play is a fast moving, game based clinic. If you're looking to hit a ton of balls and get a great workout, point Play is for you! Cardio Tennis is a drill, game and footwork based clinic. Fast paced and full of energy Cardio Tennis is a great workout and a lot of fun! This event players who want to have a fun evening playing tennis and socializing. Cost: $25 per person, which includes food and non-alcoholic beverages. Please BYOB. Format: Brief warm-up rally followed by two sessions of play (approx. 40 minutes each) with a short break in between. Please join us for refreshments and socializing in between and after your games. Teams: Players will be assigned to a different team for each session based on skill level. Register by contacting the club by phone phone: (203) 876-1776 or email: deskstaff@milfordindoortennis.com.